I'm crawling out of patience, baby. Oh yes! I'll correct that XD sorry! I love Loveline and I love Ville, so it's gotta be great. Hey, thanks for posting these. I had not heard them and they are SO fabulous. 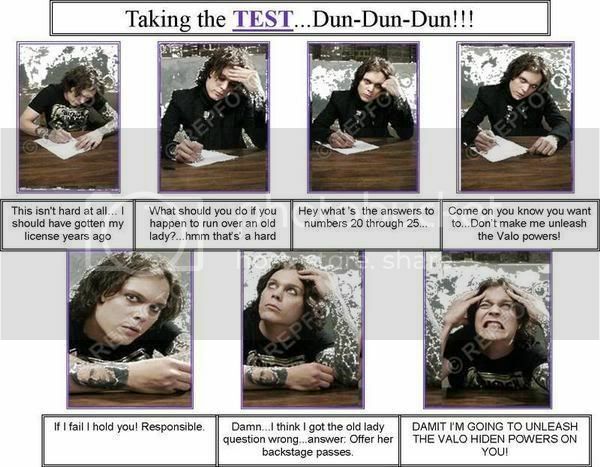 Ville is such a sweetie and smart and kind and humble. And he gives good advice. (God, I'm such a fangirl.) Again, totally enjoyed them. Thank you. Thanks for the lyrics darling. I interpret it as hes glad the music is back [beat] to give him something to put his pain into! Top hats off is like a salute! So its like "salute to the music for giving me something to channel the hurt into"
FYI "Luna Alight" is a typo and it should be "lunar light". They're gonna fix it. So did he say "luna light" or lunar light"? i saw this a couple of days ago, but did not want to say anything. but, w/e, i thingk it's cool, that atleast some ppl liked it. i made that funny strip 2-3 years ago. he asked if he could have it, i just did not know alot of people would like it.lol. I'll credit you under the pic. yes, i also made a few others, but he like this one the most.lol. i think his myspace name is Steven Drachenberg.